We all know what Facebook is. Almost all of us have an account on this website, 1.01 billion people using the site each month. They currently have over 200 million photos uploaded per day, or around 6 billion per month. There are currently almost 90 billion photos total on Facebook. This means they are, by far, the largest photos site on the Internet. How many views ? Let's keep it simple and don't answer that big number they have. This is great, science moving on, we are moving on and our social website is making billions of dollars but that is another story. All my friends have it, why should I not ? And you start to complete the form to register. You get your best photo and you set it as a profile photo, expecting to rock the Facebook world and get as many likes as possible. Maybe you become so LIKED that you get your own page and you've almost become the most popular person on your street. After that you start getting some friends because without it you can have only 0 likes and that's bad for your future " most wanted Facebook star ". You add your friends and you tell them to suggest other friends too. You even add your relatives so they can see you how big you are now, how all grown up and ready to be a big celebrity. Sometimes you even comment their photos, hoping to get some + score from others. Now you must already have "27663904" photos and "637289" albums, 3998 friends and a bunch of likes to show off ! Your life is better now, you are a Facebook celebrity among your friends. By the time all of your friends come home you had already posted some nonsense status or shared some stupid video of your dog or cat or some "adventure" you had at school or work. No one cares about it but they give you a "Likeeee" for your effort. Now this website is updated everyday so you have a cover photo and you are very excited to fill that white gap over there with some eye hurting image. After you do all this simple thing - there is nothing left for you to do, only to complete the about forms. Go ! Show off how smart you are, how much you read, how much of a boxer you are ( you like all kind of fighters ), how romantic you are ( you like stupid love photos - that website shares to make money whit your shares and likes ). You start giving your email, your messenger id and even your address, hoping that someday a big film producer or whatever will contact you to give you the big money ! You are a superstar, stop reading this ! ( if it is the case ), you don't need my opinion. When you get bored , you take some of your just bought clothes and you all dress up, go into your bathroom and make some flashy, funky, hot photos to share with your " fans ". If you are a girl remember " no clothes " is the key to success in life ! If you are " a pro " like many of facebook users are you start editing your photos, adding over - ugly and eye hurting texts or icons or whatever stupidity crosses your mind. Waiting for a comment : " OMG you're so true, your photos are amazing, I wanna be like you, my beautiful xoxo, kisses ! " . Now you are complete, a true legend on Facebook. Things are not how they look like, you are just a simple person hitting the refresh option on your facebook page, waiting for a new notification to make your day better. As soon as it comes you realize its a " invitation to play Poker " and you get back your bored, not smiling face. You wait for a message but when it shows up, the only thing you get is some spam site - making some advertise. You're not a star, not even close, you check your friends everyday and you have an obsession for this website. After you log on in and you see everything that you can possible see that day, you log off and after you close your browser, you drink a glass of water and you say " let's see what's new on facebook " . The irony is that you are some kind addicted to this site and you try to impress more than you can in real life ( on chat , in photos , etc ) . 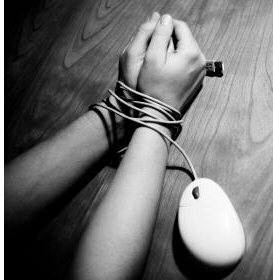 Your addiction is " feeded " with news about your ex, about your teacher, your best friend, your community and you can never get enough. The question is : Can you live without your facebook profile ? This is a fantasy irony and you must treat it like one.